Exposed to sea and surf, medieval Mljet was far from world cultural affairs. In order to preserve the island's unusual features, especially at the northwest end, it was places under the protection of the state in 1948, proclaiming it a "protected natural sanctuary". On November 11, 1960, Mljet was proclaimed a national park, side by side with Plitvice Lakes, Paklenica and Risnjak. The catamaran "Nona Ana" connects Dubrovnik with Mljet island, check the daily departure timetable from Gruž Harbour in Dubrovnik. The first inhabitants of Mljet, with all options available, chose the northwest tip of the island for their new home. 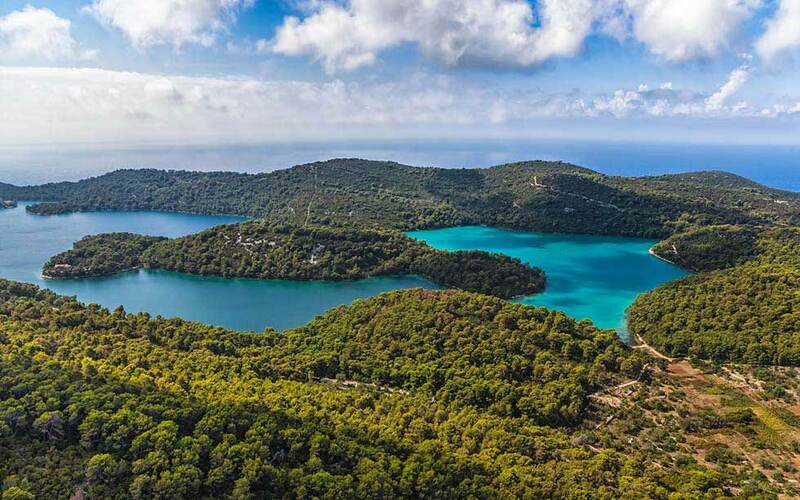 In doing so they provided that the area of first priority for habitation are the Mljet lakes with their surrounding, wooded lands. Nature has nurtured a secret life here, a marvelous world of enchantment, long before human beings encroached. And the humble Benedictines loved the area and strove to keep it for themselves, happy that they could revel in its wonders. The Veliko and Malo Lakes and Soline are the heart of the Mljet National Park. Until the human hand got involved, with clumsy attempts at correcting nature, Veliko Lake (actually a sea bay that originated from sunken karst coves) could only be entered through Soline by small boat. The passage was small and shallow and it was probably the Benedictines who had it artificially dredged in the 15th century to facilitate passage. Powerful currents started washing sea water along the channel, changing the direction in sequences of high and low tides. The clever Benedictines immediately put this natural phenomenon to good use by building a mill on the shore of the channel. The small bridge was probably built at that time. Around year 1960. the deserted Benedictine monastery was re-built as a hotel, a lovely stone bridge was devastated so the channel could be widened and the old mill was gone. It is truly a shame that it all happened. The water in it is salty, since it is connected to the open sea through Solinski Channel, but since there are no other outlets to the sea, the replacement of water in lakes is limited. This is the origin of the differences in salinity and temperature between lakes and the sea: the waters in the Lake are warmer in summer (about 24 to 26°C) and colder in winter, than open sea water. The salinity on the surface of the Veliko Lake is lower than that of the sea, and it decreases with depth. The Veliko and Malo Lakes used to be connected by a channel so shallow that one could wade across it. On the eve of WWII, during the construction of a road around Veliko Lake, a broader passage was dredged, so that small boats could have access. At that time the channel was bridged with the stone Small Bridge. Malo Lake is fed by rainwater, and underground stream, just as Veliko Lake is. The temperature of the water in Malo Lake in summer (average 26 to 29°C) is greater than the temperature of Veliko Lake and the sea, while in winter (about 5°C) it is considerably below that of Veliko Lake and the sea. The salinity of the Malo Lake surface is lower than that of the sea, but it increases towards the lake floor. It is assumed that somewhere there must be a direct underground connection between Malo Lake and the sea. Two most popular activities in the Mljet National Park are hiking and biking. There are numerous hiking trails all over the national park, and tarmac and gravel roads that suit all levels of biking. Near the Small Bridge you can rent a bike, canue or a kayak. Renting a canue or a kayak is one of the ways to get to the St.Mary Island due to sailing restrictions in the Veliko and Malo Lakes. If you are arriving to Mljet on a sailboat or a yacht, anchoring is permitted in Polače, Pomena and Lokva bays.